Learn how to give negative feedback to employees and set meaningful goals. Learn more about the 10 drivers of engagement, the science behind them, and how you can improve them. Become a data-driven HR manager with this guide perfect for beginners looking to learn about HR metrics. Understand the importance of your talent brand and how you can improve your recruiting efforts. Avoid these 15 pitfalls when conducting employee surveys, and hear from experts about what you should do. The current state of employee engagement. Real-time data. Worldwide. Everything you need to know about giving employee feedback and how to make performance reviews better. This guide on employee onboarding will teach you everything you need to know to ensure each new hire is successful. A detailed guide on what employee engagement is, why it’s important, how to measure it, and how to improve it. Looking at the different types of employee surveys, why they’re important, and best practices to maximize participation. The complete guide on what makes a good leader, and how you can learn to be a better leader for your employees. Learn everything you need to know about eNPS and how you can implement it in your company. Need To Convince Your Office? 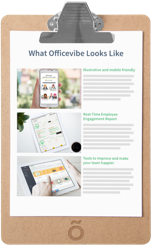 A simple summary that explains what Officevibe is and the advantages of using it. We're here to answer all your questions about Officevibe and ensure you implement it successfully. A calculator to discover the ROI of investing in employee engagement.